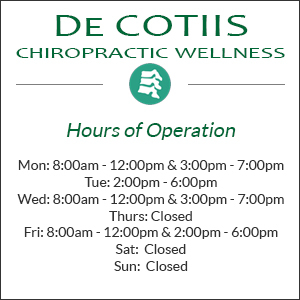 Pregnancy and Pediatric Chiropractor in Altoona: Dr. John De Cotiis of De Cotiis Chiropractic Wellness offers chiropractic care for expecting mothers. When your body goes through the various stages and trials of pregnancy and labor, your spine is subjected to extreme amounts of stress. After all, it has to constantly adjust itself to bear the growing weight of another person over a short time frame of just nine months. The center of gravity shifts forward and substantial weight gain adds stress to the spine of the expecting mother. This stress frequently causes lower back pain, headaches and migraines, nausea, insomnia, and other symptoms that can wreak havoc on your quality of life. It is best to deal with any potential injury, misalignment, postural problem or other ailment as soon as possible when it is identified. After all, the nervous system controls and coordinates every stage of growth and development; you should want to keep your child’s nervous system as healthy as possible through regular treatment.